Hemp Building represents one of the first local uses of our local hemp crop. For Australian Hemp Building products please visit www.hempmasonry.com and The Australian Hemp Masonry Company on Facebook page. 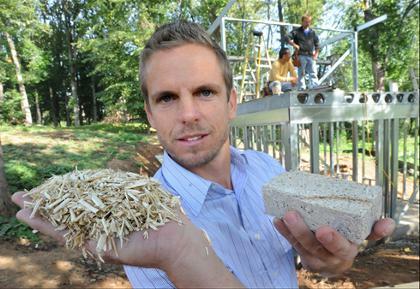 In Asheville, N.C., a home built with thick hemp walls was completed this summer and two more are in the works. Dozens of hemp homes have been built in Europe in the past two decades, but they’re new to the United States, says David Madera, co-founder of Hemp Technologies, a company that supplied the mixture of ground-up hemp stalks, lime and water. This masonry traditional lime and hemp bio-thermal cure the homes of modern pathologies (eg humidity), restores and enhances the old buildings, on all media and in all climates. It allows the creation of an organic architecture ecological living in comfort and fertile.